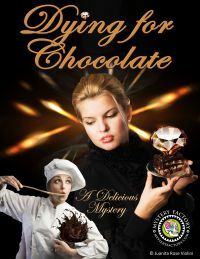 The murder mystery script, Dying For Chocolate, is a mouth-watering event filled with romance gone wrong, a carob cowboy and a secret ingredient; all wrapped in chocolate. Requires 3 male and 3 female professional improv actors or eager amateurs, some props and minimal rehearsal time. A chocolate coated, lip licking funny dip into the world of high finance confections. When the Carob Cowboy takes his cut of the market share, it’s time to eliminate the competition.